culture mami: Bibbidi Bobbidi Blu! Last week I attended a special screening of Disney's Cinderella at the Walt Disney Studios in Burbank to celebrate it's October 2nd Diamond Edition release to Blu-ray. I brought my mom, sister and Audrey along and we all had a lot of fun enjoying and falling in love again with this classic. 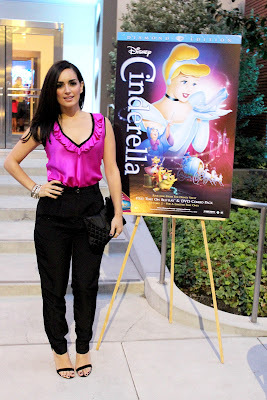 The screening was hosted by Mexican actress Ana De La Reguera (remember the nun in Nacho Libre?) and she is as beautiful, elegant and graceful in person as in her films . She was super sweet when meeting and taking pictures with us. Princesses were given shiny crowns to wear and lot's of little girls in attendance were dressed up as little Cinderella's. It was great to have a girls night ...first time I was away from baby Frank for more than 2 hours... and of coarse he did fantastic (kids usually act up with me : ). Kip says he chugged his bottle down and he was sound asleep in his bassinet by the time Audrey and I got home. 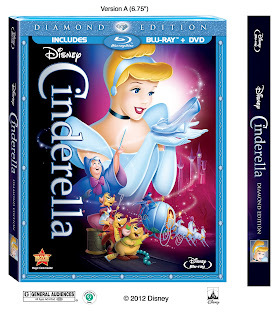 Disney's Cinderella Diamond Edition will be released tomorrow October 2nd to Blu-ray, which includes a Spanish version of the film (Audrey loves that Princesses speak Spanish!).... a perfect gift for any princess. Qué chévere!! Me imagino como se habrá divertido tu pequeña.